Early on in the first volume of Susan Sontag’s recently published diaries, it becomes evident that she was a champion list-maker. 2. To interpret is to determine, restrict; or to exfoliate, read meaning into. 3. Interpretation is the medium by which we justify context. 4. To interpret a word is different from defining it; it means to specify a range of contexts (not equivalents). left Dec. 27 with David—D wearing Oxford grey pants. Subway to [Boston's] South Station. 8:00 train. . . . In N.Y. 12:15. Took a cab to the Gov. Clinton [Hotel]. Checked in, washed, took cab via Empire State Bldg. to Golden Horn restaurant. Ate shish kebab. Cab to Metropolitan Museum. 3:00 -5:00 the Egyptian exhibits and the Etruscan Warrior. Rosie arrived. Bus back to hotel. Washed and changed. Left at 6:10—David clinging to TV, Rosie about to whisk him across the street to Penn Station + out to Flushing [where Rose McNulty's family lived] for the night. Took cab to Hotel Taft. Herbert & Inge [Marcuse] there, Peter + Frances arrived a few minutes later. Walked to Parisienne restaurant. Rushed, lobster dinner. Walked back to Winter Garden [Theater]. Troilus and Cressida. Afterwards, with Tommy + school chum added, went across the street to the Taft bar for beer. Tommy + chum left, then Peter + Frances to drive back to Waterbury [Connecticut]. Walked with Inge + Herbert to subway at Columbus Circle. Goodnight. Back to hotel. Asleep by 2:00. Goodnight indeed. The whole trip reads this way, in abbreviations and summaries of meals eaten and people seen. This mania is at its highest peak, predictably, during moments of intense emotional stress, and seems to provide Sontag with some illusion of control. In 1957, during her last few days in Boston, before leaving to go to Oxford for a year, she writes down everything, including what she ate, when the truck came to pick up her library books, and when she went to the bathroom. There is an equally detailed first day in New York, which David Rieff, Sontag’s son and editor of the diaries, tells us he has cut. Perhaps these are records of how she has spent her time, whose purpose is partly to assuage herself that she has not wasted it. Or perhaps it is a straightforward record of what was done when, should the need ever arise to justify her activities on a particular day. Possibly Sontag was steeling her nerve to leave her husband and child by running over every last detail; the fellowship at Oxford is meant to only be for a year, but we know, and surely Sontag herself knew on some level, that she would never go back to Philip Rieff. But there is something very eccentric about this habit, something manic, frantic. Who writes down when they peed? What possible non-medical purpose could that serve? Sontag herself wasn’t completely sure why she was keeping the diary. The only answer she could come up with is the same one every writer eventually admits. Superficial to understand the journal as just a receptacle for one’s private, secret thoughts—like a confidante who is deaf, dumb, and illiterate. In the journal I do not just express myself more openly than I could to any person; I create myself. The journal is a vehicle for my sense of selfhood. It represents me as emotionally and spiritually independent. Therefore (alas) it does not simply record my actual, daily life but rather—in many cases—offers an alternative to it. . . . Why is writing important? Mainly, out of egotism, I suppose. Because I want to be that persona, a writer, and not because there is something I must say. And a few days later, on January 2, 1958: “This notebook is not a diary. It is not an aid to memory, so that I can remember that on such and such a date I saw that film of Buñuel, or how unhappy I was over J, or that Cadiz seemed beautiful but Madrid not.” She leaves off without explaining what the notebook is. It appears that Sontag could no better explain why she kept her diary than we can explain why we want to read it; she felt she could wield some control over who she was becoming, and we do the same. If we are what we read, then reading even Sontag’s jots and scribbles may help us make our own jots and scribbles more Sontagian: we read to learn not only how to be as accomplished as she was but to witness how she wrought accomplishment from disarray. Twenty years later, in an interview with Jonathan Cott, Sontag explains “I write partly in order to change myself; it’s an instrument I use.” However, if as Sontag says she writes to change herself, then she is writing all of this down not only to record it, not only to seize control over her life but to change herself into the kind of person who can contain all that experience and triumph above it. She writes herself into leaving her husband. She writes herself into surviving H. And she writes herself right into her career. The diary is, then, an instrument of self-change, and an instrument to measure how far one has come. It is also, however, a curiosity cabinet: a place to store all the weird and wondrous things that have surfaced in Sontag’s consciousness. What you like: your five favorite flowers, spices, films, cars, poems, hotels, names, dogs, inventions, Roman emperors, novels, actors, restaurants, paintings, gems, cities, . . . What you’ve done: everyone you’ve gone to bed with, every state you’ve been in, country you’ve visited, house or apartment you’ve lived in, school you’ve attended, car you’ve owned, pet you’ve had, job you’ve held, Shakespeare play you’ve seen . . .
What the world has in it: the names of Mozart’s twenty operas or of the kings and queens of England or of the fifty American state capitals. . . . Even the making of such lists is an expression of desire: the desire to know, to see arranged, to commit to memory. What you actually have: all your CDs, your bottles of wine, your first editions, the vintage photographs you’ve purchased at auctions—such lists may do no more than ratify the acquiring lust, unless, as it is with the Cavaliere, your purchases are imperiled. [My] First Beethoven quartet: Op. 127. Mr. Shepro. Eating in the teachers’ cafeteria. Sobbing on Mother’s bony bosom before going to bed. Wanting to be better. Dr. Berman, the dentist in N.Y. Wait’s Topical Paste. Peter + I translating Walpurgisnacht together. This particular passage goes against the grain of the image of the young Sontag we get from the earliest diary entries as somehow having bypassed childhood, having been born an adult mind. On the contrary, she had a childhood, and from the sound of it her childhood wasn’t much different from any other postwar American suburban childhood. Moreover, for someone who often reminded people that she was an adopted New Yorker, she was essentially a product of New York Jewry; although she grew up in Arizona and California, she was born in New York, and went often to see her family there. It is interesting to see the extent to which she owns up to this in the diaries. Owns up to it, that is, not in so many words but in the persistence of New York‒related ideas in this autobiographical list; a vision of who Sontag privately thought she was emerges. Lists, like collections, function to save information perceived as somehow valuable from being lost in the abyss of the unconscious. They consist in the things one has found and the things one wants to acquire. But as Sontag makes clear in The Volcano Lover, the idea of collecting is tied to the idea of destruction. To have amassed a collection is to put oneself in danger of losing it. The only way to lose one’s experience is to forget it; if it is to be valuable—for personal purposes, or for literary ones—it must be inscribed somewhere. In the same story, travel is also “accumulation . . . the colonialism of the soul.” Accumulation is part of how Sontag relates to the world—not only in terms of her own erudition, actual or projected, but in terms of how she herself has experienced the world, on an ontological and psychological level. The story itself takes the form of a list: all the things she thinks of when she thinks of China, what she will do and where she will go when she gets there. The listing is at once an accumulation and a disburdenment, a list and an exorcism. By free-associating around the idea of China, Sontag tunnels through her feelings about her father’s early death (in China, of tuberculosis, she hints) with her conception in China and with her Arizona upbringing, where she once dug a hole so deep the housekeeper asked if she was digging to China. This double impulse—to gather and to release—reveals Sontag to be, like the Cavaliere, a collector. Collectors have a divided consciousness,” she writes in The Volcano Lover. No one is more naturally allied with the forces in nature that preserve and conserve. But every collector is also an accomplice of the ideal of destruction. For the very excessiveness of the collecting passion makes a collector also a self-despiser. Every collector-passion contains within it the fantasy of its own self-abolition. . . . Destruction is only the strongest form of divestment. The collector may be so disappointed with his life that he wants to divest himself of himself, as in the novel about the book-besotted reclusive scholar with a legendary horde of twenty-five thousand necessary, irreplaceable volumes (that dream, that perfect library), who pitches himself into the pyre he makes out of what he has most loved. But should such an angry collector survive his fire or fit, he will probably want to start another collection. The novel to which Sontag refers, above, is, of course, Canetti’s Auto-da-fé, and his immolation a “fantas[y] of disburdenment.” As the Cavaliere sells off his pictures, “he felt himself lighter, relieved of a burden.” And what he ends up missing is a worthless piece of cloth that falls off his coach. What Canetti says at the end of this progress of admiration, his homage to Broch, suggests what there is most to admire. The last achievement of the serious admirer is to stop immediately putting to work the energies aroused by, filling up the space opened by, what is admired. Thereby talented admirers give themselves permission to breathe, to breathe more deeply. But for that it is necessary to go beyond avidity; to identify with something beyond achievement, beyond the gathering of power. 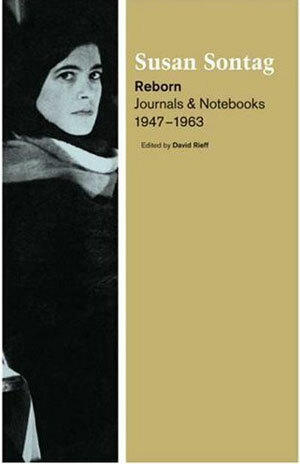 Some critics have remarked upon the fact that in the diaries, Sontag says next to nothing about her affair with and marriage to Philip Rieff until the marriage is already in trouble; her son David appears suddenly in an aside, and there is nothing about her pregnancy, his birth, or his early life. The relevant years of the diaries are missing—whether this means they were lost or not kept at all, Rieff says he does not know. Given this last statement from the Canetti essay, I think we can safely say that the reason Sontag hardly mentions her early marriage and her son’s birth is not because these events were unimportant to her but because they were unproblematic. Any journal keeper will tell you that the journal accumulates most of its entries in times of stress or upheaval. During a particularly domestic period, however, Sontag has allowed herself to “breathe”; not to force these achievements to mean something beyond themselves, but to live them as herself, as the self she was when they occurred, and not as the self she was trying to become. We do not know her emotional state during this period—we cannot say she was happy and untroubled; we can only say that she was willing to let this time serve nothing but itself. And so Sontag’s silences tell us almost as much as her lists. Her stay in Paris in 1958 proves to be strengthening and demoralizing at once; locked in a masochistic relationship with “H.,” her ex-girlfriend from Berkeley, Sontag finds, for the first time, the limits of her strength. After reading about herself in H.’s diary, and learning exactly how her lover feels about her (“she really doesn’t like me but my passion for her is acceptable and opportune”), her ego is bruised, and all sorts of self-doubts creep in. We see Sontag doubt herself earlier in the journals, we see her concerted effort to reinforce her self-confidence, but her self-esteem has never fallen as low as we find it during that year in Paris. H. comes across as a monster; the reader wants to shake Sontag by the shoulders and tell her to leave. But Sontag has embarked on a sentimental education, and will not be put off-track. That question mark is for herself. She seems to have had a fair hunch, as early as age fourteen, that she was in an intellectual league of her own. What is it they say about genius—that it is 1 percent inspiration, and 99 percent perspiration? Sontag’s diaries give us a glimpse into the work that went into the second part of that ratio. We end the diaries with an intimate sense of Susan Sontag. And it is comforting to find that, brilliant as she was, she was not born a flawless vessel for transmitting her genius—she had to work at it. These journals contain the struggle. Lauren Elkin is a writer, literary critic, and Ph.D. candidate in English literature. She writes about books and French culture on her blog, Maîtresse, and lives in Paris.